Two more blocks done with 2 to go...Woo hoo! I started out the week by doing some Christmas shopping with my daughter on the Saturday before Thanksgiving. We got most of it done. I hosted Thanksgiving at my house and enjoyed it as well as the wonderful smells of all the goodies cooking. On Friday my daughter and I went out AFTER the craziness of black Friday and finished our Christmas shopping. 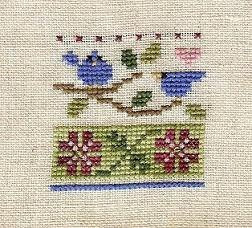 The evening was spent resting up and getting to stitch and of course it didn't hurt that the Blues(NHL) were playing either. GO Blues! I have several finishes since my last post. I also whipped up a Cross-eyed Cricket mitten. These are the two halves of CEC 12 days toppper for the ornaments I did earlier this year. I also got back to my Redwork and finished up another block which was a good sized one. 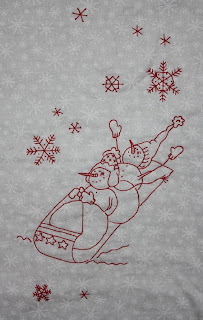 The snowflakes on all of these are my least favorite part to stitch I guess because they are such short runs before a turn. After that one I started and finished the next...it was a nice small one. I'm now working on block #7 which is 1/2 done. I hope to keep going and get them all done so my mom can get the quilt put together. 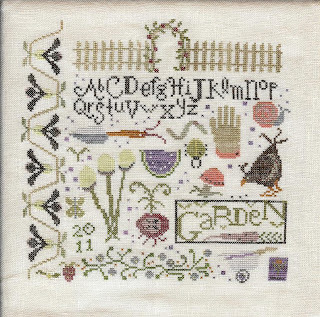 The Homespun Elegance is for sale for $3 + actual postage. Check out my 2nd page tab for all my leaflets still for sale from my finishes. I keep several Prairie Schooler santas in the car for stitching while waiting. I finished this one Wednesday and just remembered to bring it in to show it. 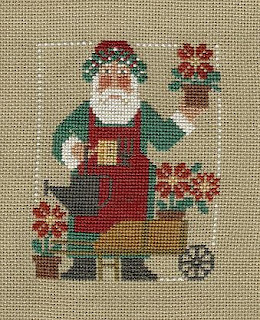 This is the 1993 Gardening Santa. 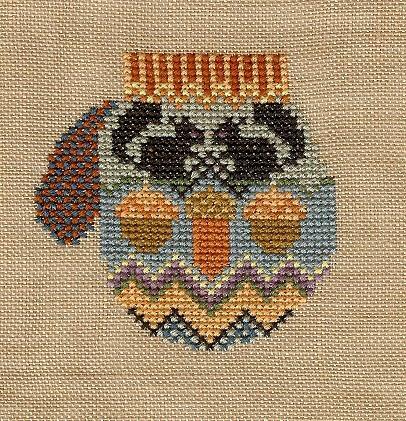 I am selling this pattern for $4.50 + actual postage. I'm selling this leaflet for $5 + actual postage. 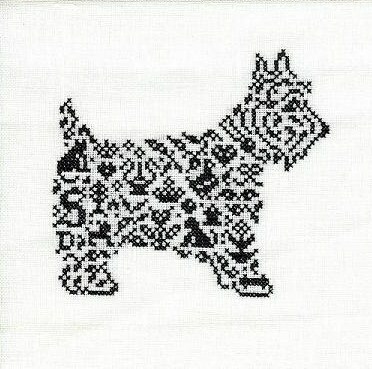 This was a fun quick stitch...It's JBW's Scottie Dog....there are quite a few possibilities in stitching....stitch with white on black or black on hunter green....all quite cute. Not quite sure yet just how it's going to be finished as it would be a good sized ornament if I choose that. Sandy, the chart will be in your hands next time I see you. We had close to 70 degrees the last few days with a storm predicted for last night....We did get the rain the last 3 days but they downgraded the storm and boy the temps have dropped with a high of 52 today and strong wind gusts. 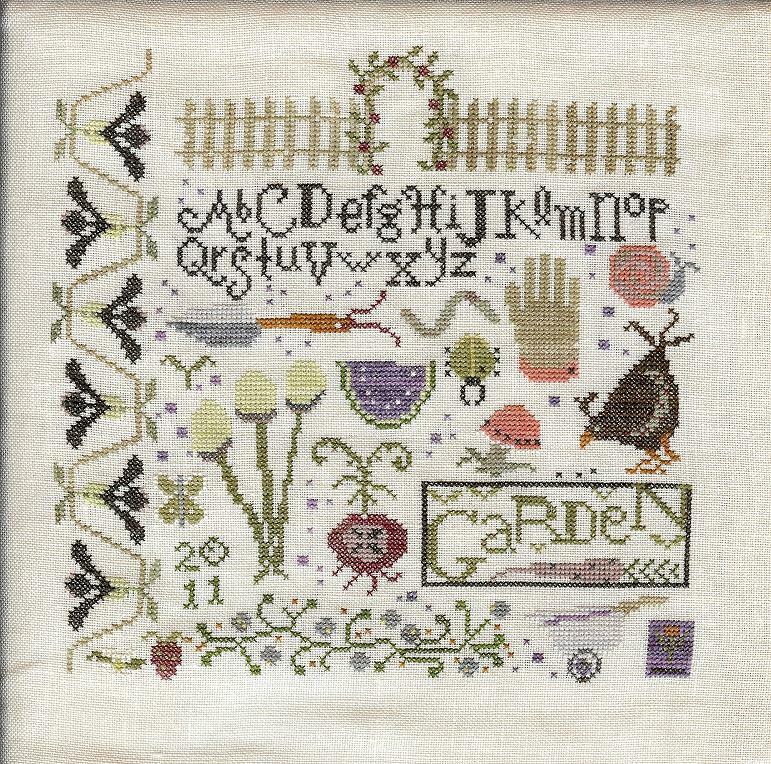 With all of this I had been working on a garden piece by Shakespeare Peddler called Magic Garden Sampler. I did it on 40ct. Bittersweet. Boy do I like stitching on 40 ct. 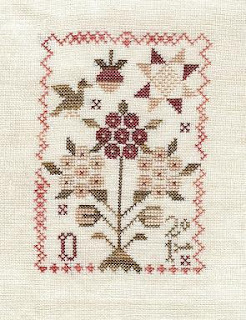 I didn't know when I posted earlier that I would get this fob done but here it is....it's the bonus chart with the Lizzie Kate When we do chart/kit. I've love Lizzie Kate's recent releases. I just picked this piece up Tuesday morning at stitch club and immediately had to start it. 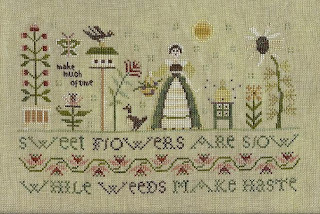 There are 2 more of her charts pictured on the pattern that are a must for me. 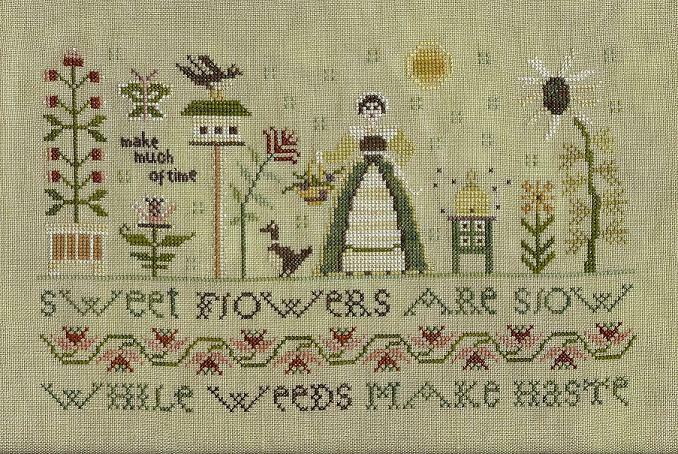 I substituted threads pretty closely as I have minimal CC fibers and prefer weeks & Gast anyway. Oops, in a hurry that I didn't heat up the iron. Starting the bonus fob included in the package. I'm selling this pattern(along with the bonus when it's done) for $4.00 + actual postage. I have a new finish...but I can't show it for quite some time as it will be a gift and the recipient might see it here...so I'm just teasing you all but wanted to post as it's been a week since my last post. 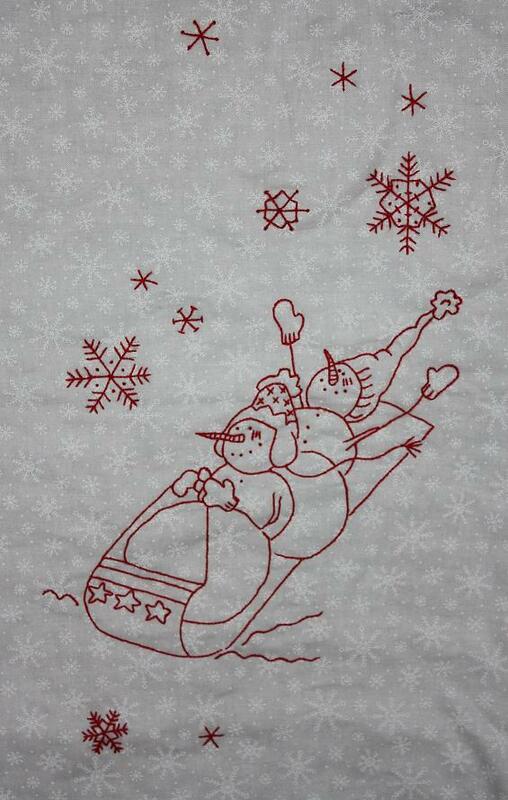 I will be adding the leaflet to my sale page though.